What happens to a world-class caricaturist when he decides to pursue a career in music? Does he lose his 15 minutes of fame, if he’s not successful as a recording artist? And what happens when he becomes a music teacher to pay the rent and put food on the table? Well, if you’re Ulf Kaiser, who came to Australia as a 15 year old from Austria, speaking little English and staying at the Villawood hostel in Sydney, you go back to your first love – drawing caricatures in the style of David Levine, the famous artist long associated with the prestigious New York Review of Books. Ulf, now in his fifties, would love to return to caricatures, but hasn’t found a newspaper or magazine or online publication willing to hire him, even on a freelance basis. I worked with him on The Australian newspaper in the early 80s when I was the literary editor and TV critic. When you needed a quick professional caricature, getting to the essence of the subject, Ulf was your man. Anyone from American author Saul Bellow to former Prime Minister John Curtin, to blues/jazz singer Tom Waits, plus a self-portrait of the artist as a younger man, as you can see above. Like Levine, Kaiser’s caricatures ranged from politicians to authors to artists and entertainers and writers – and like any newspaper artist, he drew portraits of journalists on their departures or their significant birthdays or events. 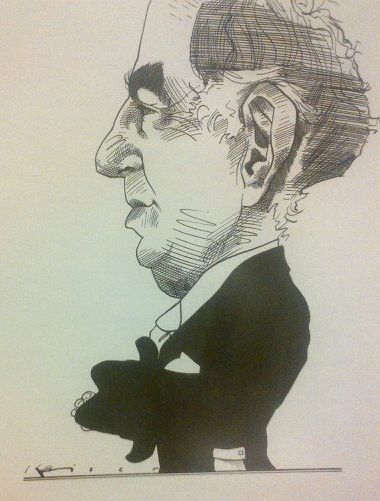 I hadn’t seen Ulf for at least 20 years, and this profile began when I had a query from the political editor for the Nine Network, Laurie Oakes, a friend and former colleague on the Sunday Program, asking if I knew who had drawn the caricature below of former Governor-General, Sir Zelman Cowen. The Parliamentary Secretary to the Prime Minister and Federal Member for Kooyong, Josh Frydenberg, had the caricature hanging in his office, and he wanted to make a plaque out of it. But he asked Laurie if he could confirm who the artist was, and when the caricature was drawn – probably for the Sunday Program. As soon as Laurie emailed me the drawing, I knew it was Ulf, and called him to check on the date. Enter Ulf Kaiser, the artist, who began what he called a “wonderful project” painting historic sites for the Roads and Transport Authority (RTA), as part of their Heritage and Community Department. They commissioned him to paint Monet-esque landscapes, including famous Australian buildings, like the first concrete bridge in the Southern Hemisphere and governors’ residences. It lasted for four years until one of the managers of the project died unexpectedly. Enter Ulf Kaiser, the musician. He’s always had a love for music, but the opportunity arose for him to record a few albums in Australia, and they went pretty well. He invested some money, hoping his songs would go just as well overseas. Where else would you go to record an album, but Abbey Road in London, where he met people like John Barry of James Bond film themes fame, and had to vacate studios for the likes of the Beatles, Annie Lennox, George Michael and Harry Connick Jnr, to name a few. Where to, from here? Ulf’s degree and experience in London enabled him to get a job teaching music in Australia on condition he go to Bourke High School. He loved teaching the kids, but Bourke was no picnic. From the outback to the western suburbs of Sydney Ulf wound up teaching music at Lurnea High School – a home of sorts. It’s not where he’d really like to be – at home or in an office, drawing caricatures of the rich and not so rich, and the famous and not so famous.